A scene from the Noh play "Benkei on the Bridge". 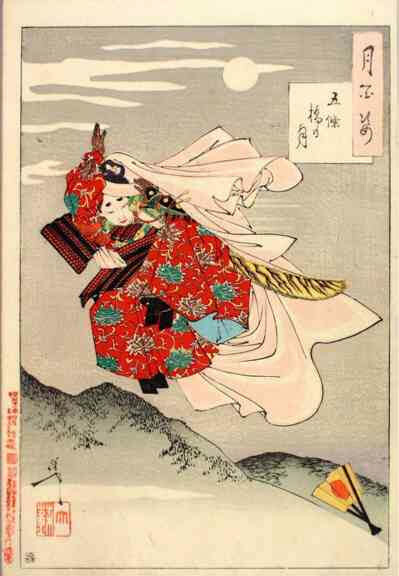 The child Minamoto Ushiwaka in mid jump, defending the passage on Gojo Bridge in Kyoto against the warrior-priest Benkei. When Benkei cannot defeat Ushikawa, and learns of his high birth, he humbly surrenders. Ushiwaka later became the legendary General Minamoto Yoshitsune (1159-1189), and Benkei his loyal follower. 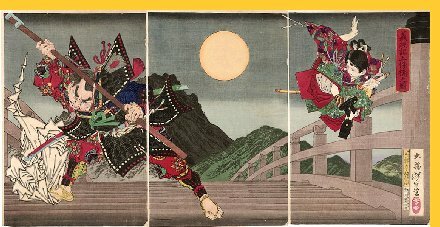 Below is Yoshitoshi's 1881 triptych with Benkei far left, ducking Ushikawa's tessen (iron fan). Published April 1888.